This little spicy jumble of goodness might appeal to those with an adventurous palate. You can prep everything ahead of time and throw it together in 10 minutes. I added some jalapeno, red peppers and some fun things like ginger and maple syrup. I even added a wee bit of soy sauce, sesame oil and sherry at the end for that lip smacking flavor. Sounds a little wacky, doesn’t it? It might be but it’s deliciously wacky! You can leave out the jalapeno if the kids don’t like it spicy. 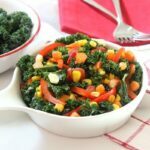 This dish is so full of important nutrients for your little guys that you’ll want to include it in your regular meal rotation especially because it takes no time at all. 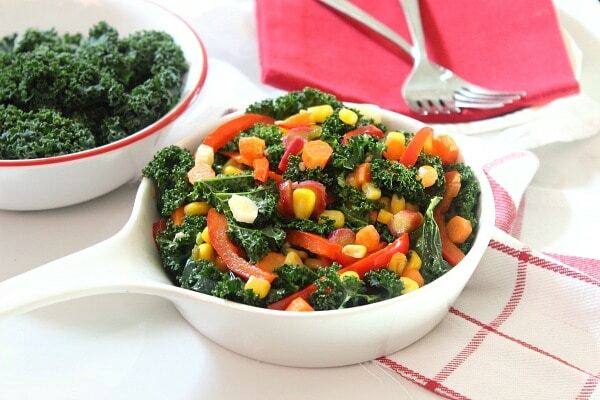 Best of all when you’re in a rush, you could skip the chopping and just use frozen veggies. Keeping a good supply of frozen veggies on hand is a life saver for busy weeknights. You can prep everything ahead of time and throw it together in 10 minutes. I added some jalapeno, red peppers and some fun things like ginger and maple syrup. Heat oil in large skillet or wok on medium-high heat and add ginger, garlic and jalapeno. Saute for 1 minute. Add carrot and cook for 2 minutes. Add bell pepper and corn, maple syrup and salt cooking for an additional 2 minutes. Add kale and cook for approximately 45 seconds or until slightly wilted, drizzling in sherry, soy sauce and sesame oil. Serve immediately.